03 Jun“Of Myth and Magic” Now Playing at Atlanta Fringe Festival-May 28th-Jun 17th! How fun! To expand opportunities for Do You Believe In Magic? my one hour 47 min audiobook, I created an edited 45-minute version audio drama for radio shows. It was accepted for the Atlanta Fringe Festival-Audio and is now playing from May 28th-June 17th online! 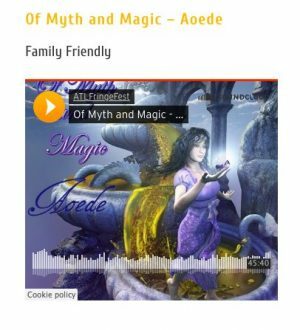 I invite you to listen by clicking the picture below, scrolling down to “Of Myth and Magic,” and if you like it, click the little heart (the winner receives a little prize 🙂 ) Thank you!